The first phase of the art was dedicated in May 2006 by Healdsburg Mayor Mike McGuire and Voigt Family Sculpture Foundation founder Al Voigt. The second section was dedicated in July 2007 by Congressman Mike Thompson and Al Voigt. 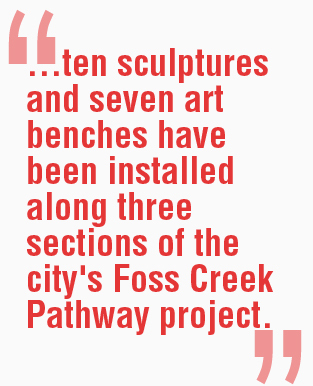 The art will be on display for an indefinite period, and new works will be installed along the Pathway as new sections are constructed. The foundation is pleased and proud to be affiliated with the Healdsburg community, which has become an international destination for food, wine, weather, and art. Visitor and demographic information about Healdsburg is available at the community website.